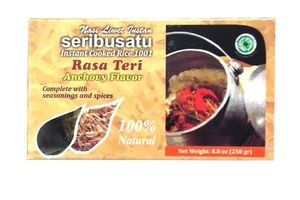 Seribusatu Nasi Liwet Instan Anchovy Flavor (1001 Nasi Liwet Instan Rasa Teri) in 8.8oz (250g) box. Complete with seasonings and spices. Nasi Liwet is a kind of food from Solo, Central Java. Rice is usually cooked in water, but Nasi Liwet is rice cooked in coconut milk and chicken broth, thus giving the rice a rich and succulent taste. This is a traditional Javanese way of cooking, from the past until now. In the past, the pan used for cooking was made of clay. 100% Natural. Product of Indonesia. Halal Certified حلال . Nasi liwet is a kind of food from Solo, Central Java. Rice is usually cooked in water, but nasi liwet is rice cooked in coconut milk and chicken broth, thus giving the rice a rich and succulent taste. This is a traditional Javanese way of cooking, from the past until now. In the past, the pan used for cooking was made of clay.